The Lynching Sites Project of Memphis partners with a growing network of organizations and congregations of faith in order to acknowledge our shared history of racial violence and our ongoing resolve for racial justice and racial healing. One such organization is the Ida B. Wells Commemorative Art Committee, which has commissioned the creation of a sculptured monument by Chicago artist, Richard Hunt, to honor the life of Ida B. Wells. Ida B. Wells has symbolic importance to the vision of LSP, which is opening our hearts and our communities to racial healing by turning the light of truth on lynchings in Shelby County, Tennessee. The Ida B. 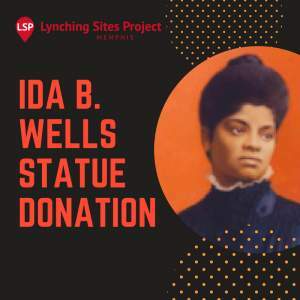 Wells Commemorative Art Committee is 55% of the way to their goal, and LSP would like to help ensure that the legacy of the fearless civil rights advocate is well preserved. Donations may be made through the Lynching Sites Project of Memphis website . We ask that you indicate on your donation in the "Honorarium" blank, or in the special notes section, that your contribution is for the Ida B. Wells monument. We would love to make a collective gift to the Ida B. Wells Commemorative Art Committee on behalf of the LSP, so if you could also make your contribution by July 10, 2018, and send an email to jessica@lynchingsitesmem.org so we can track the contributions, that would be appreciated.